Founded in 1871 as a merger of three small farm towns during post-Civil War Reconstruction, Birmingham, Alabama is now the largest and most populous city in the state. The city’s location, which is tucked in the Appalachian Mountains, once served as a major industrial center and is the cross-section of two major railroads. Often referred to as “The Magic City” or “The Pittsburgh of the South”, Birmingham experienced rapid growth from the 1880’s to the 1920’s. Birmingham is often considered the Birthplace of Civil Rights. It’s vital role in those important times is made permanent in the Sloss Furnaces National Historic Landmark and the Birmingham Civil Rights Institute. Birmingham’s economic roots are in iron and steel production but the city has altered its course of economic development and is now a place for medical research, banking and service based economy. 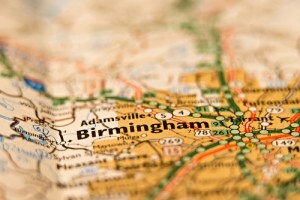 The largest employers in Birmingham include: University of Alabama at Birmingham, U.S. Government, Alabama Power Company, Compass Bank, City of Birmingham, Children’s Hospital, Regions Bank, AT&T Telecommunications, Inc., Birmingham Board of Education, and American Cast Iron Pipe Co. Inc.
Birmingham is home to 40,680 Businesses. According to birminghamal.gov, this southern city is home to “three universities, three colleges, four junior colleges, three technical schools, three religious training schools, four business and 276 public schools.” Birmingham is home to a highly education population. According to point2homes.com, roughly forty percent of the population holds a bachelor’s degree and nearly thirty-eight percent holds a graduate degree. The City of Birmingham has spent the last several years working towards a more sustainable city by creating a sustainability plan and changing policies. · City operations serve as a model of energy and resource efficiency. · Reinvestment in existing communities conserve resources. · Private developments incorporate cost-effective sustainable planning and design features at the regional, citywide, neighborhood and site levels. In 2015, Birmingham was awarded a 3-STAR Community Rating for sustainability in leadership. According to starcommunities.org, the award evaluates cities based on seven factors, some of which include seven areas related to sustainability, such as built environment, economy and jobs, health and safety, and natural systems. “Birmingham joined the STAR Community Leadership Program to establish a benchmark of our sustainability performance. Through the STAR assessment process, we learned about where we are succeeding and where we can improve,” said Mayor William A. Bell, Sr.
· Expand city recycling program to more users where feasible. · Promote participation in recycling. While the city of Birmingham is focused on increasing sustainability and recycling in both businesses and homes, Junk King Birmingham is also focusing on those same goals. As a green-minded company, sustainability is what drives our business. With the rental of a Junk King roll away dumpster, all of your unwanted items are taken to a recycling warehouse where unwanted items are sorted. Each and every dumpster rental collection is combed through for metals, e-waste, paper, household goods, textiles, furniture and appliances by Junk King employees to avoid tossing it into the landfills. “Going green” is more than recycling, it’s a source for true sustainability. Junk King is dedicated to finding ways to donate, repurpose, and reuse everything from clothing, toys, baby cribs and strollers to office furniture and supplies from each and every MINI Dumpster rental. Junk King is proud to have many of its trucks run on biodiesel, a domestically produced fuel made from more environmentally safe non-petroleum, renewable resources. Junk King is committed to continuing to lead the way to help keep the planet clean, green and beautiful for the generations to come. As Birmingham works to a more sustainable future, Junk King is prepared to help businesses and residents alike with clean-outs, construction debris and any other junk removal needs you may have. Junk King Birmingham can assist you in your remodel, move or big clean-out with its convenient, affordable roll away MINI Dumpsters. Simply contact Junk King with your chosen date and time to schedule your MINI Dumpster rental and once your job is complete, your junk will be rolled away. The Junk King MINI Dumpster is delivered to your door where it will stay for 3 days or until your job is complete. For the quickest, easiest and most purposeful way to remove your junk and debris, simply call or visit Junk King online for free quotes by phone or an online estimator and fast, affordable service. Junk King Birmingham is committed to sustainability and to the City of Birmingham. If you are ready to begin your clean-out, the MINI Dumpster is the perfect solution! 1) What size dumpster will I get? a. The Junk King MINI is the most convenient solution for your junk removal. A 12-cubic yard, driveway friendly debris box is delivered right to your place of business or your home and can complete most jobs. 2) What will the MINI Dumpster haul away? a. As long as it isn’t hazardous, Junk King will take it! From furniture, appliances, textiles, construction debris, yard debris and more, the Junk King MINI is the perfect solution. 3) How much does the MINI Dumpster cost? a. Junk King offers fair, competitive and unique pricing. Our rentals allow our customers to only pay for the space you use. 4) How long do I have to complete my cleanout? a. The Junk King MINI will be delivered to your door to be filled on your own terms and will be pick up in three days. If you are looking for a green-minded way to dispose of your junk or assist with your next home remodel, Junk King Birmingham is here to help! Our customers are what keeps us going and their reviews help us to run a better business and remind us of the good we do every day in their lives and the lives of our community. Are you working towards a more sustainable Birmingham? Junk King Birmingham is sharing those same goals and we are committed to leaving a cleaner, greener tomorrow behind us. Our top-rated customer service is what we pride ourselves on. Please consider using Junk King for your dumpster rental and junk removal. Call today 205-686-4599 or visit Junk King online to get a quick and easy quote for your MINI Dumpster rental. This entry was posted in Uncategorized and tagged construction debris, construction debris disposal, Construction Waste Disposal on August 31, 2017 by Julian Torres, "JT". Last updated August 31, 2017 .